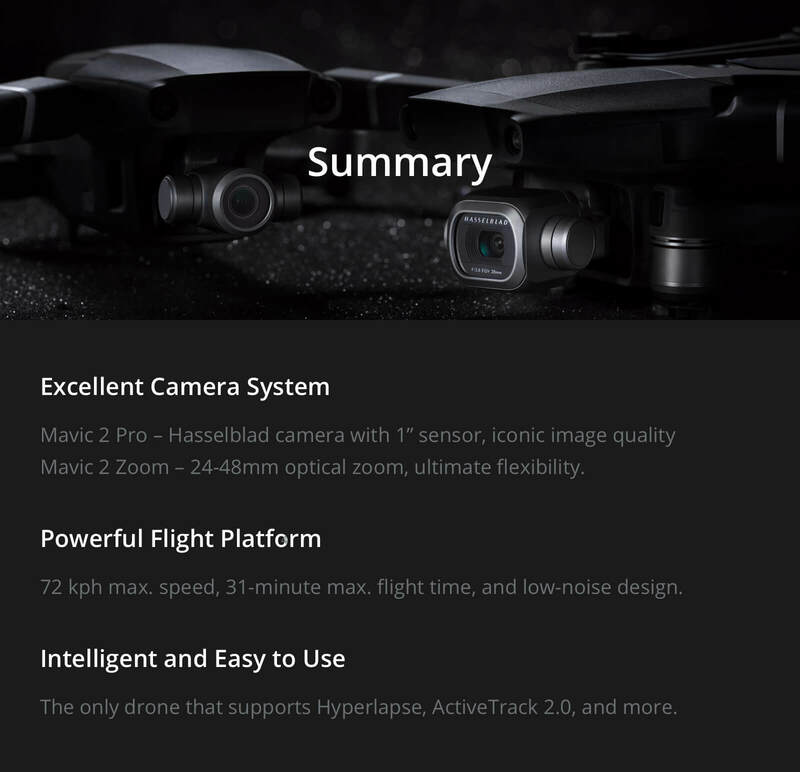 Bring the world closer with the DJI Mavic 2 Zoom quadcopter, which comes standard with a 2x optical zoom lens. 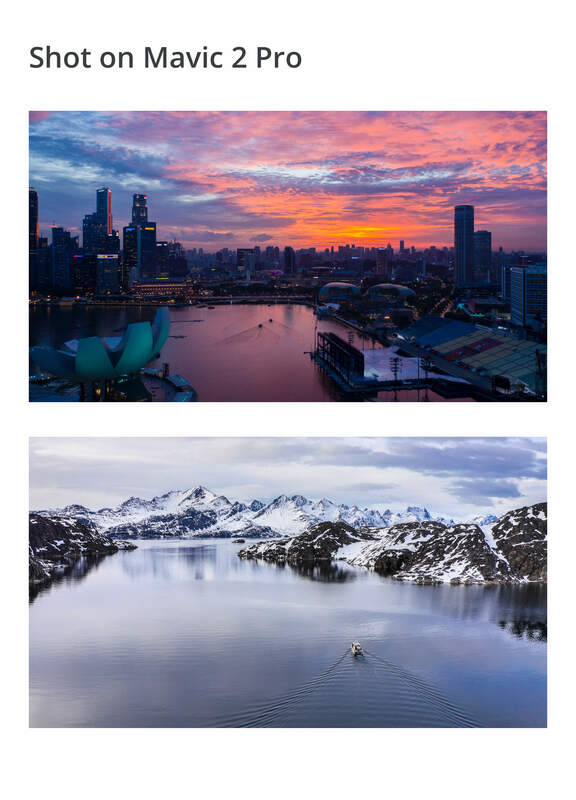 Give the command, and your Mavic 2 Zoom goes from its 35mm-format equivalent 24mm to 48mm. 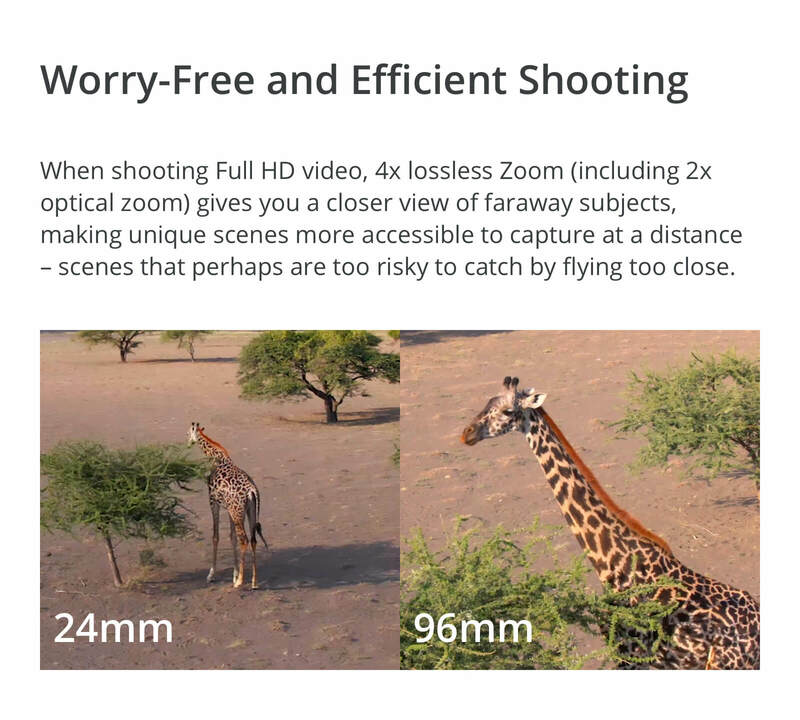 The camera on the Mavic 2 Zoom captures still photos at a clear 12MP and video in 4K, 2.7K or Full High Density (FHD). 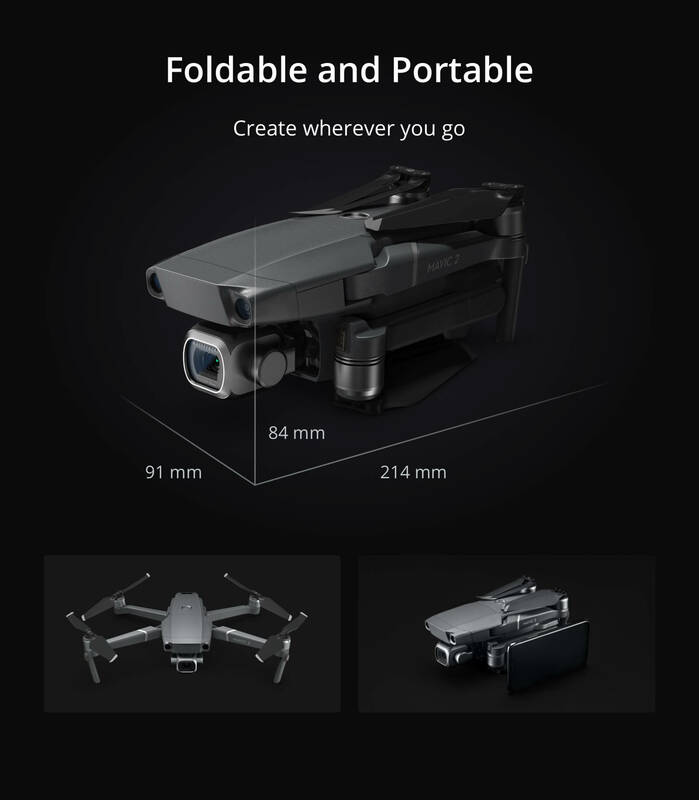 Mavic 2 drones are the new flagships of the DJI consumer line of proven, capable, highly portable folding quadcopters. 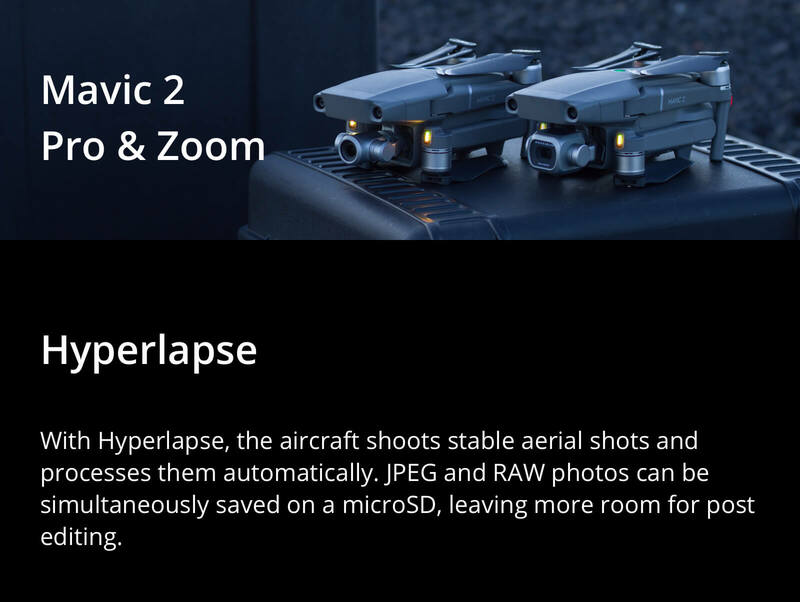 The Mavic 2 Zoom is packed with pilot and photographer aids that facilitate obstacle avoidance, timelapse, hyperlapse, subject tracking, and images recording during aerobatic maneuvers. 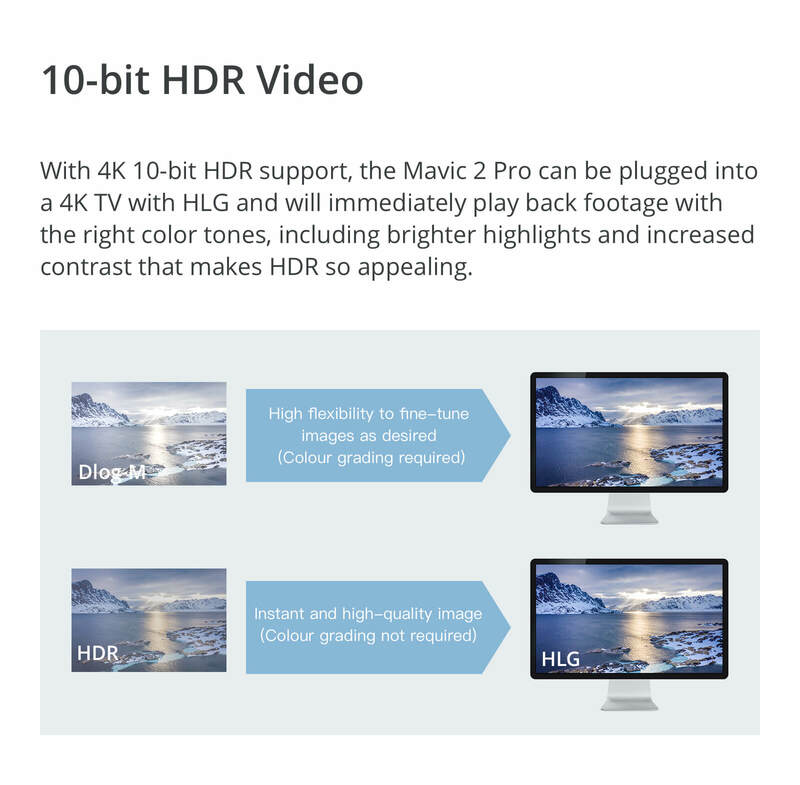 Flight time is a long 31 minutes, and high-definition live video streams interference-free over 5 miles, the longest distance yet for a Mavic and unmatched in the consumer drone market. 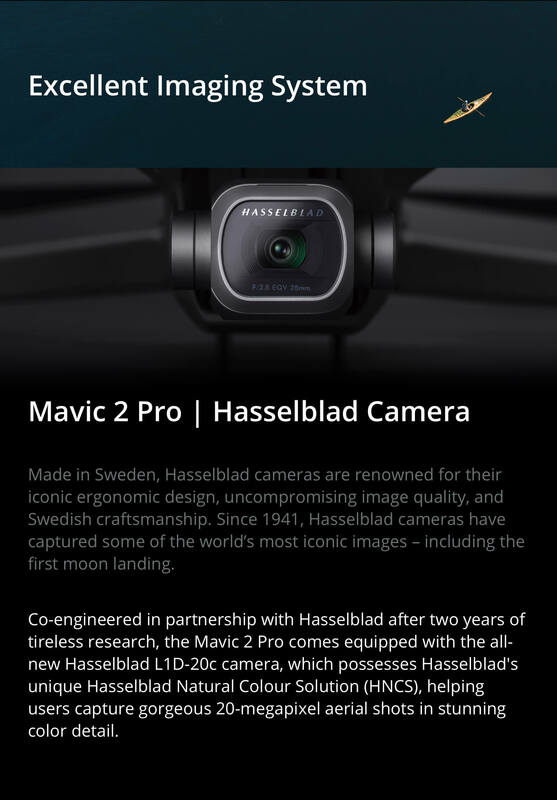 In addition to the Mavic 2 Zoom, there’s also a Mavic 2 Pro, which has a fixed-lens Hasselblad camera for stunning stills and videos. Start with the aircraft itself. It has a sturdier build, noticeable the moment you unfold the arms and click them into place. They are more solidly built than the arms on earlier Mavic drones. The gimbal hangs from the nose of the aircraft as before, but it doesn’t extend as far below the body. That better protects the gimbal and camera during landings and in the event of mishaps. 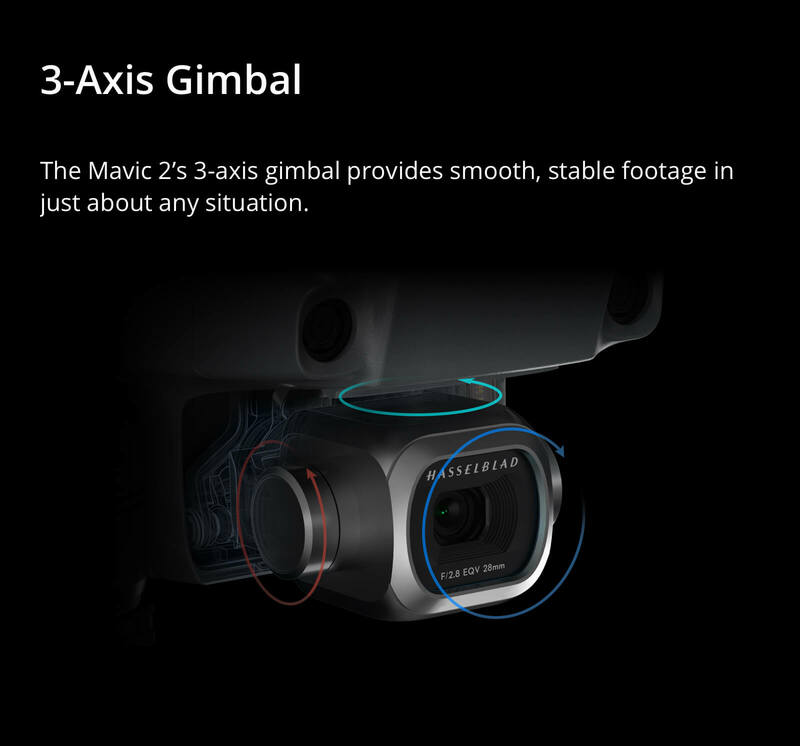 The gimbal cover is one piece and easily removed/replaced. Ten sensors are distributed across all surfaces, not just some, enabling Omni-directional Obstacle Avoidance. (More on that below.) 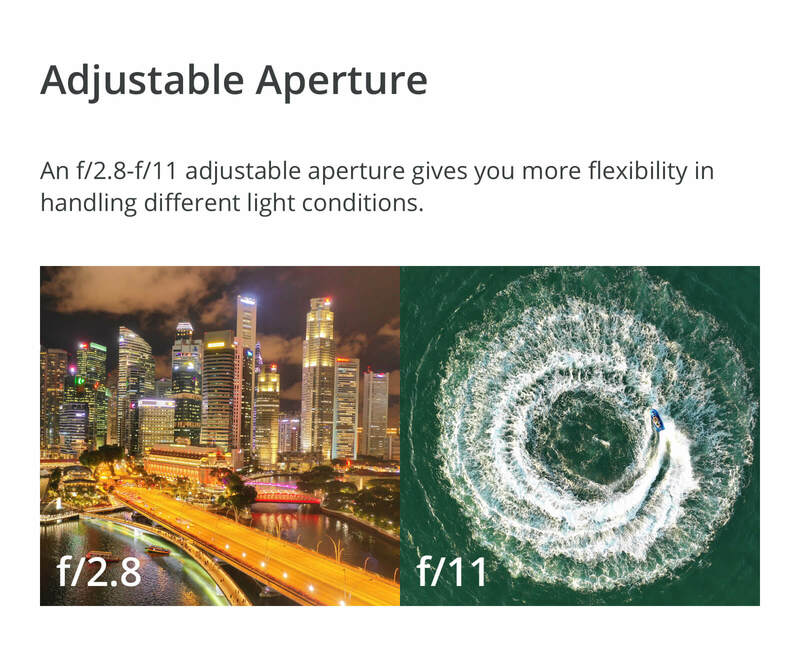 You’ll also find a built-in light on the bottom, which helps fly and land in low-light situations, including indoors. 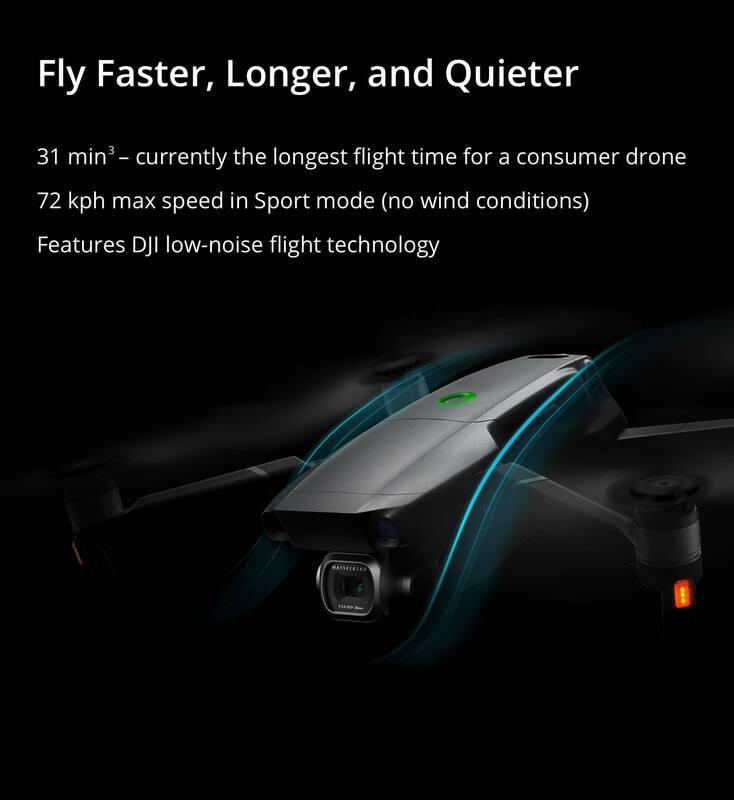 The motors are more powerful than on the original Mavic Pro, and the propellers are quieter than even the low-noise props designed for the Mavic Platinum. The camera is the biggest news. 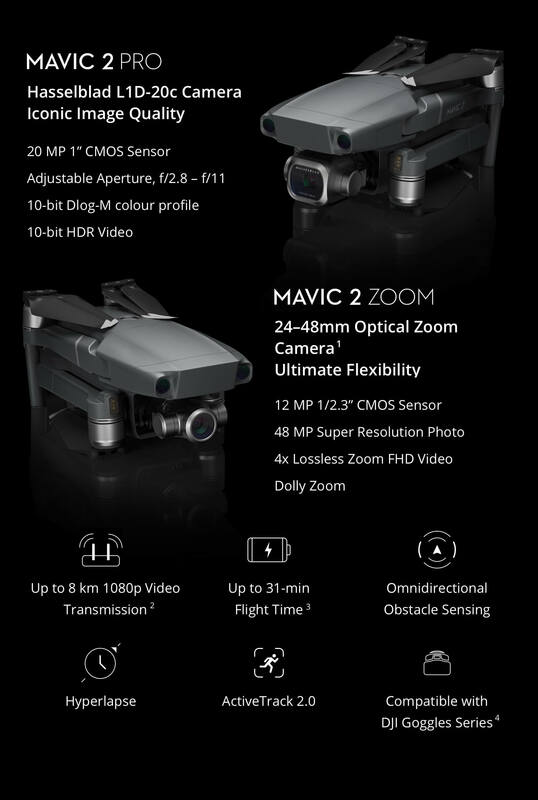 The Mavic 2 Zoom camera, as the name implies, has an optical zoom lens with two focal lengths. 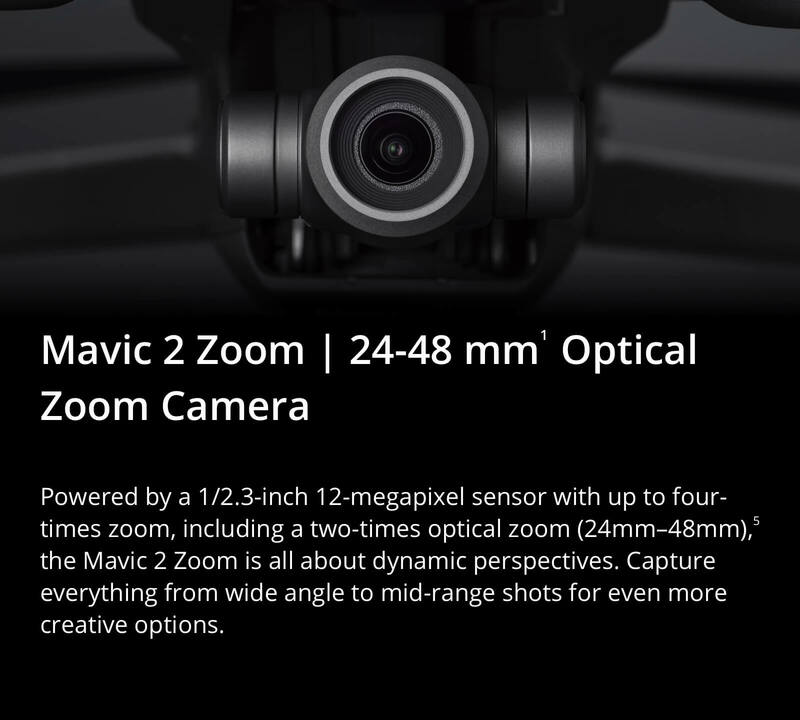 The Mavic 2 Zoom camera has 2x magnification. 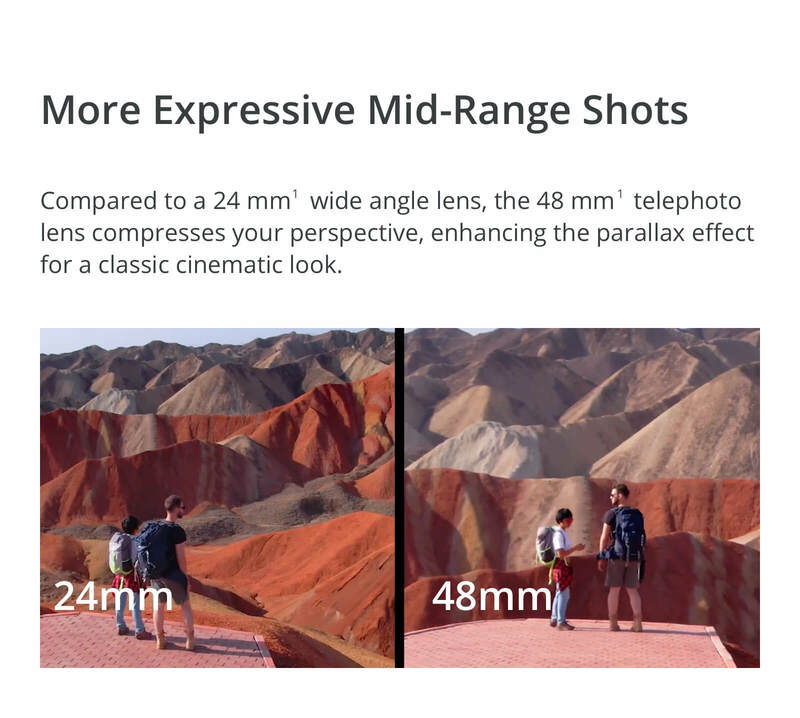 Give the command, and the focal length of the lens changes from the standard 24mm to 48mm. Bring objects visually closer. 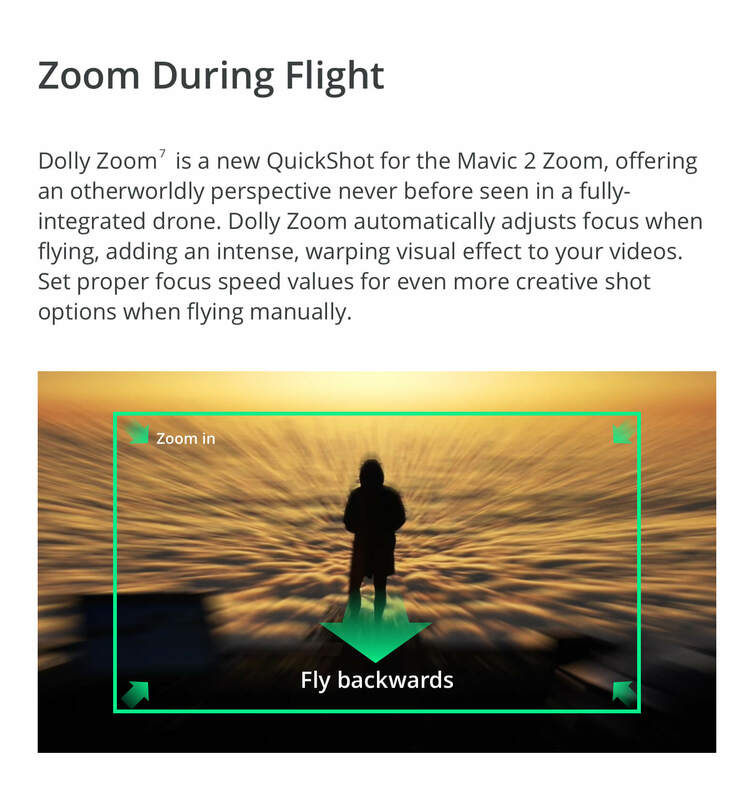 Create stunning visual effects with the longer lens, including with use of the dolly zoom program, which gradually changes the focal length as the drone moves toward or away from the subject. 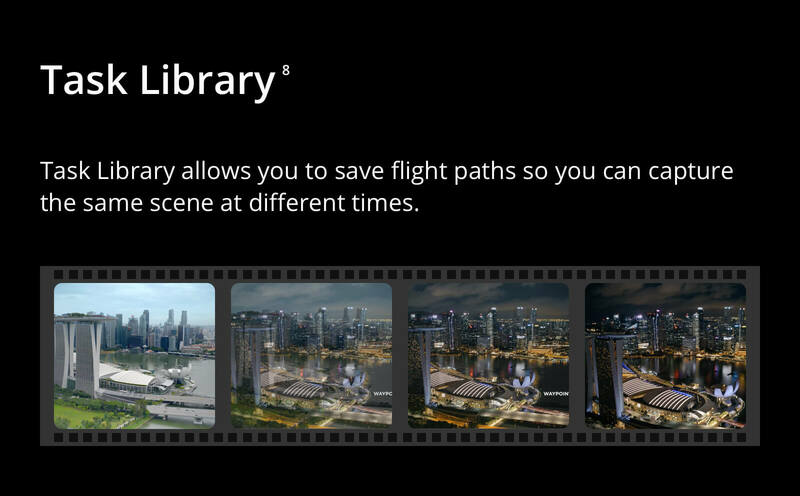 The Free setting lets you control the drone manually. 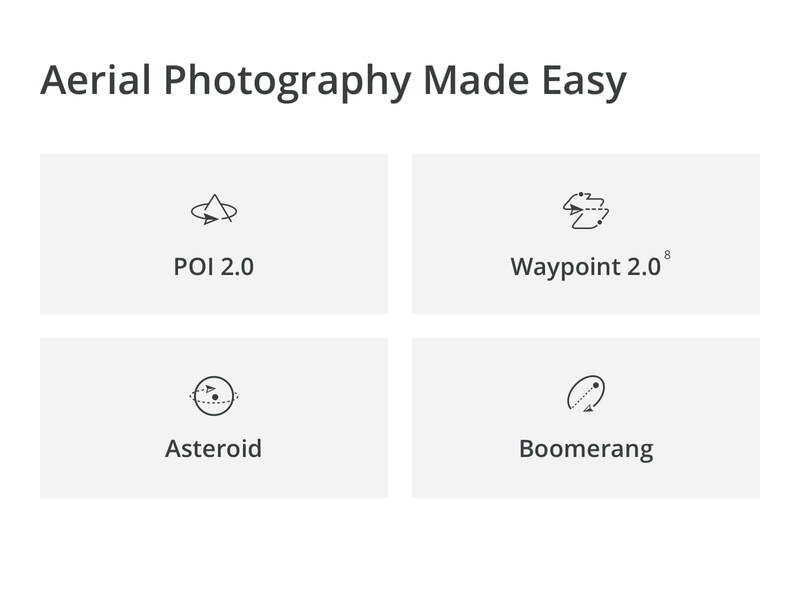 Circle lets you draw a circle around your subject can follow that course after determining the interval of shots and the duration of the shoot. 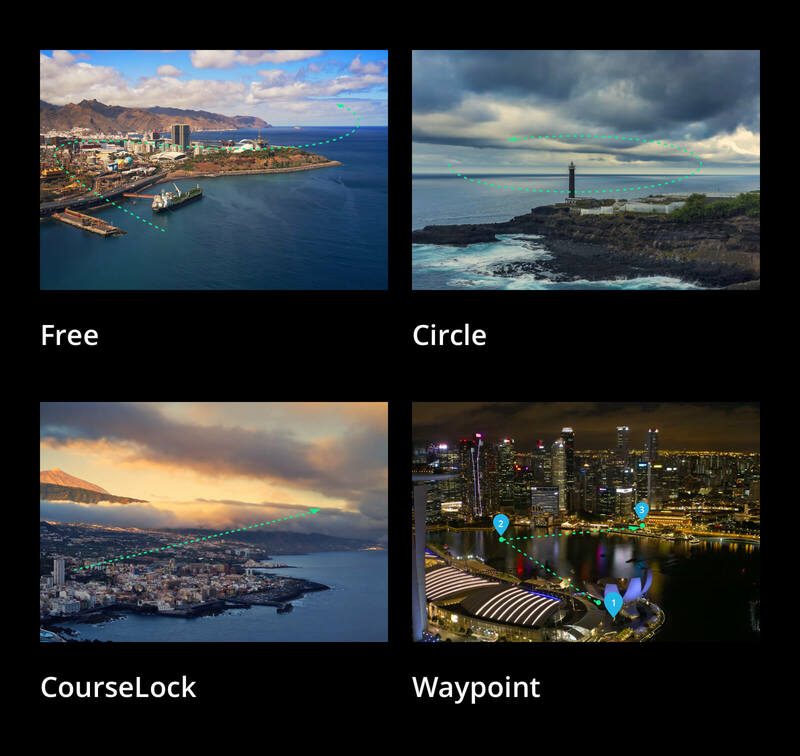 With Course Lock, select a point on the map, fly to it automatically and make adjustments you may want along the way. 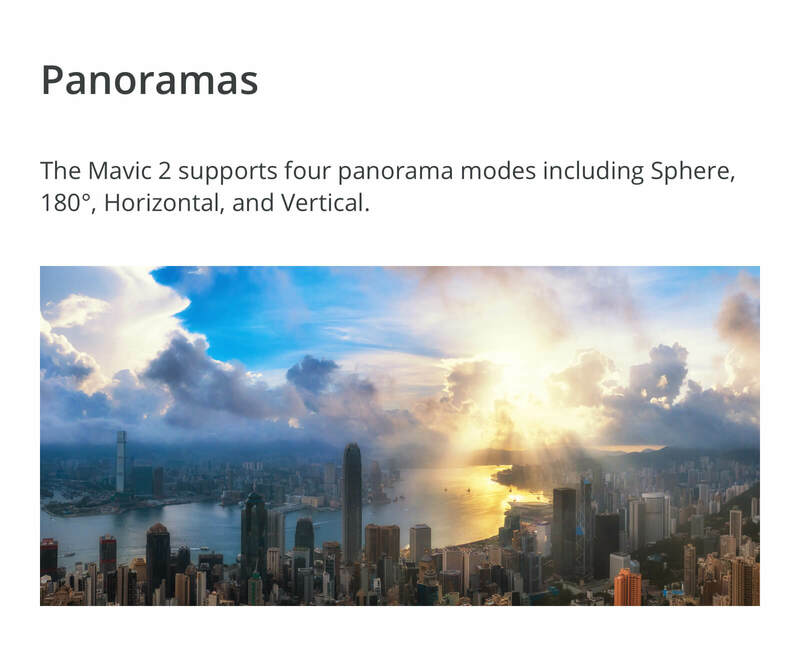 Using Waypoint, designate multiple points on the map, and the Mavic 2 flies to each, making a timelapse of each and of the whole flight. 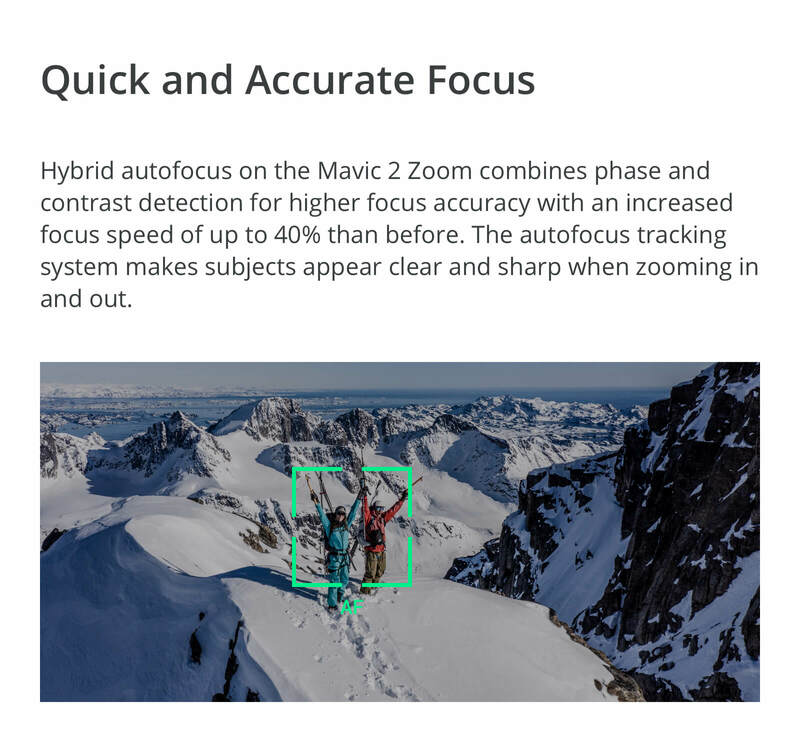 DJI software upgrades improve the quality of imagery on the Mavic 2 Zoom. 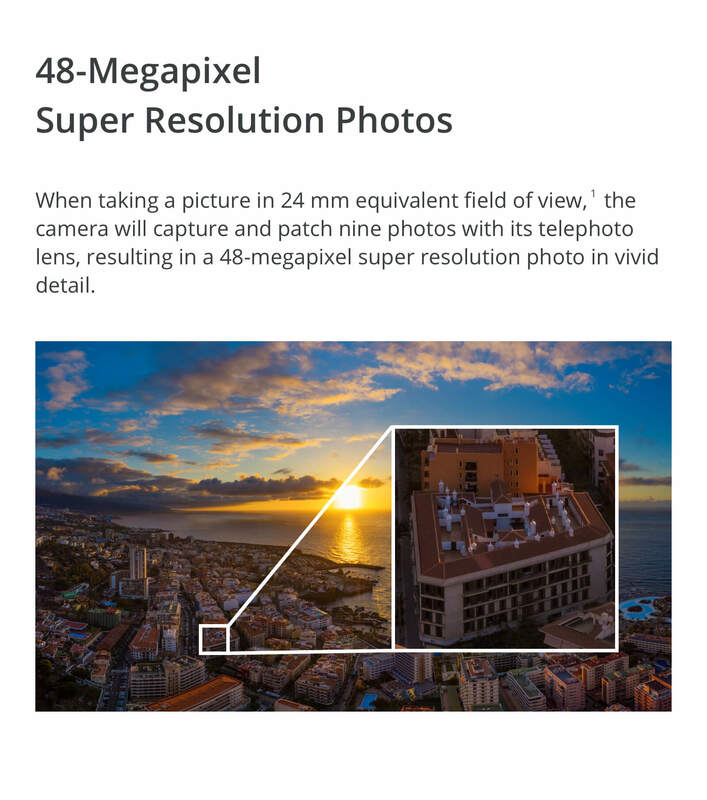 Super Resolution creates a 48MP image using the 24mm focal length. 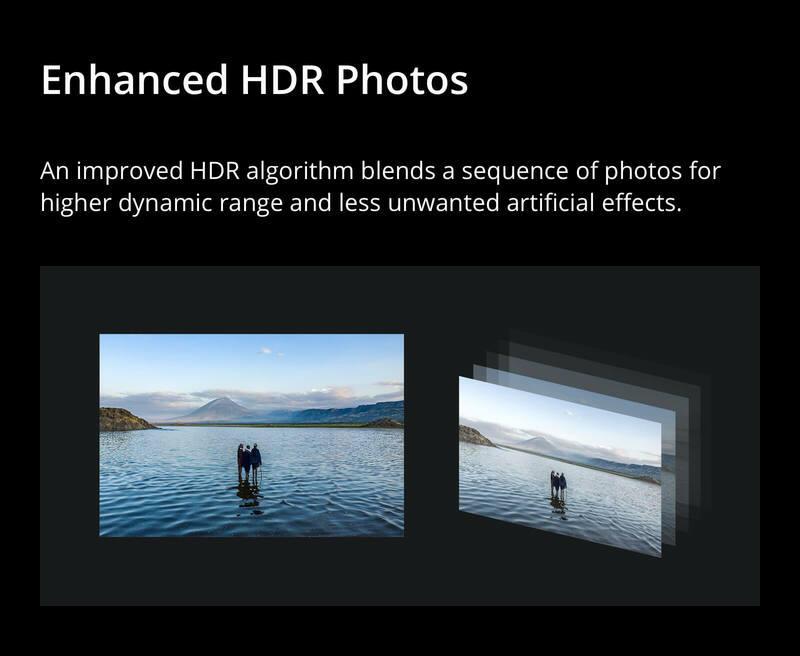 Enhanced High Dynamic Range (HDR) creates 13 exposure values in each image and results in greater contrast. 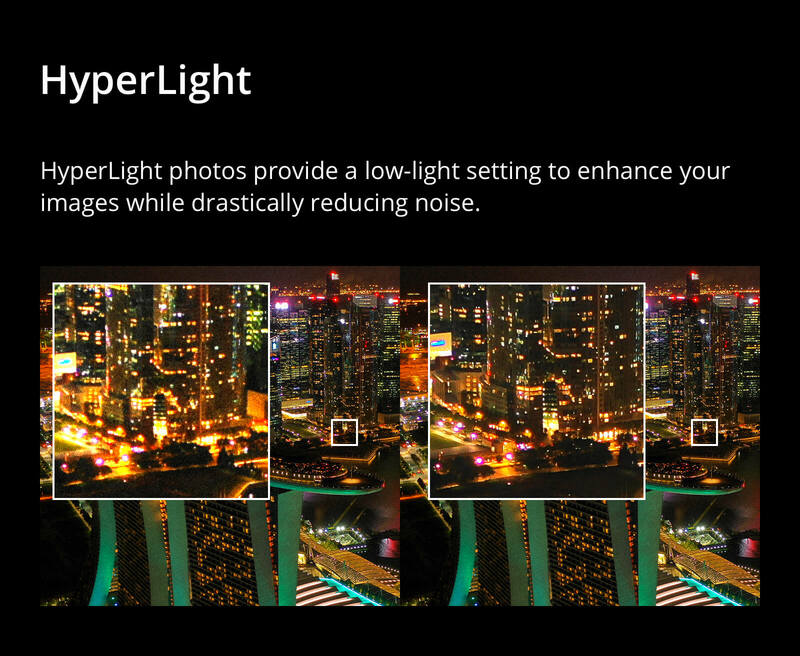 HyperLight optimizes HDR in low light. 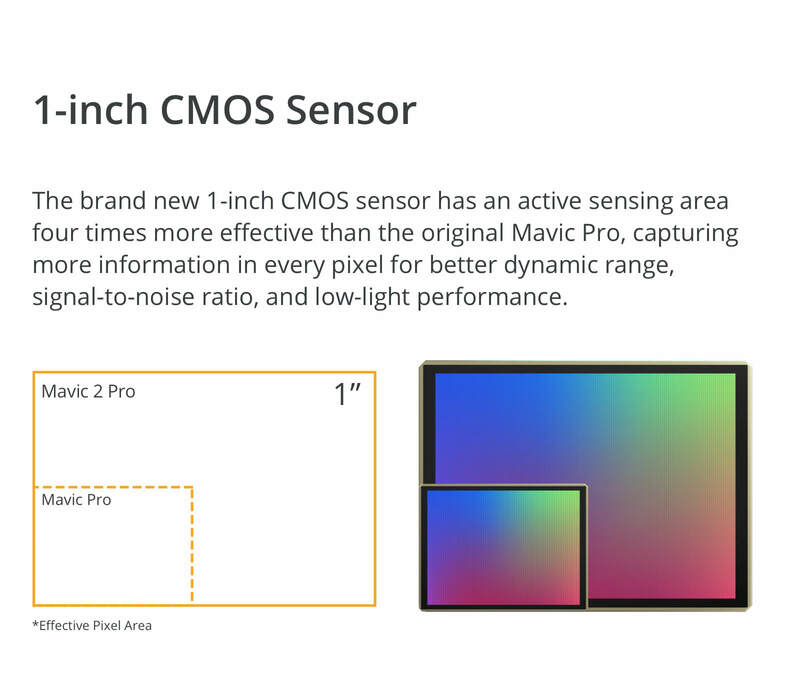 The Mavic 2 Pro has sensors on every surface for advanced obstacle avoidance: front, back, top, bottom, and both sides. 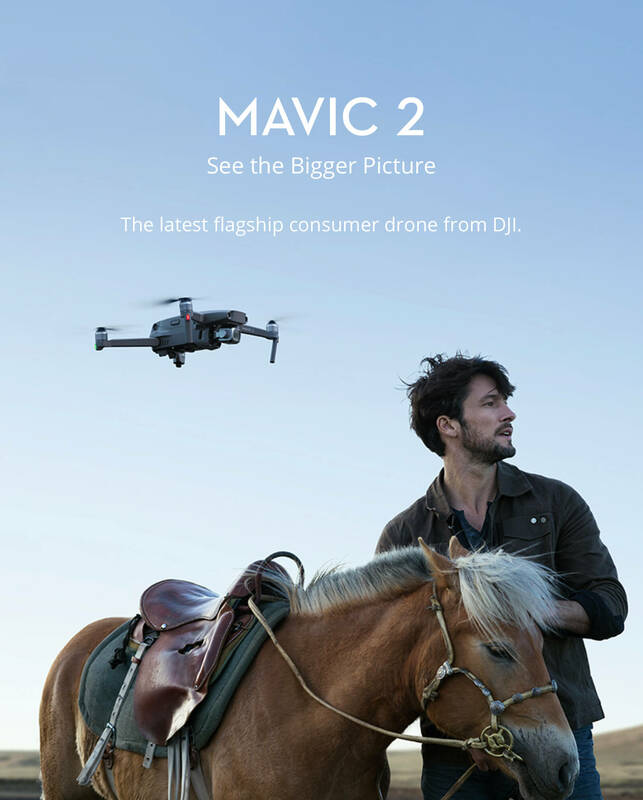 The Mavic 2 Pro thoroughly avoids obstacles while flying forward or backward by using the sensors and Advanced Pilot Assistance Systems. 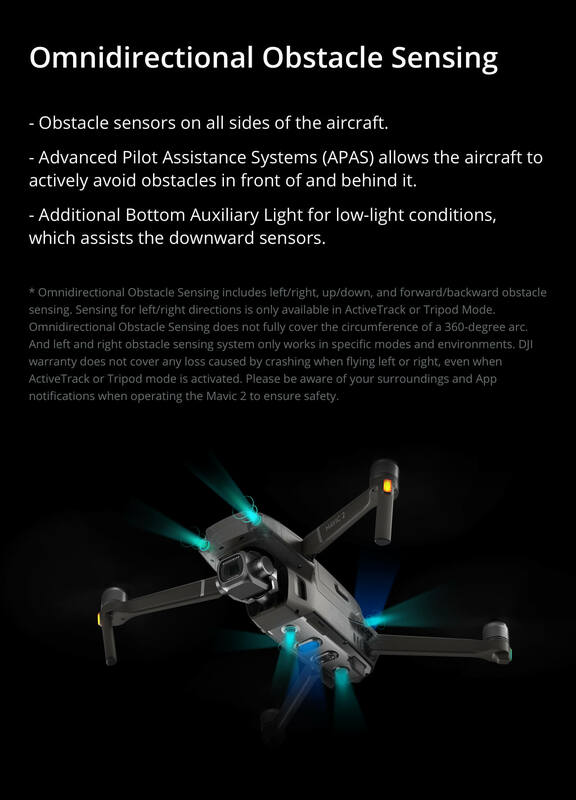 The drone doesn’t sense obstacles over a complete 360 degrees, and the right and left sensing operate only in ActiveTrack and Tripod modes. 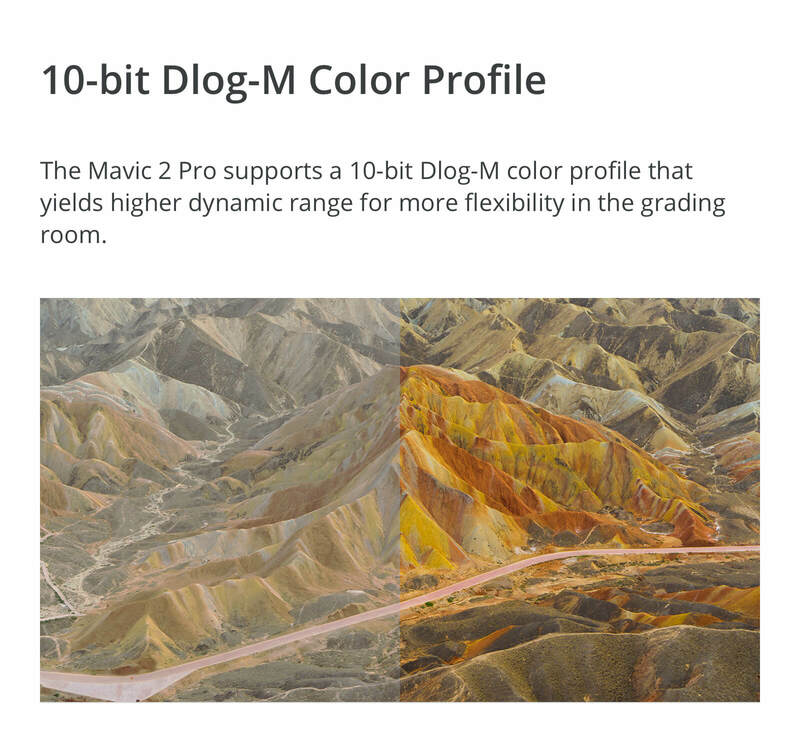 Still, the obstacle avoidance on the Mavic 2 Pro performs at a level you might expect only on much more expensive drones. 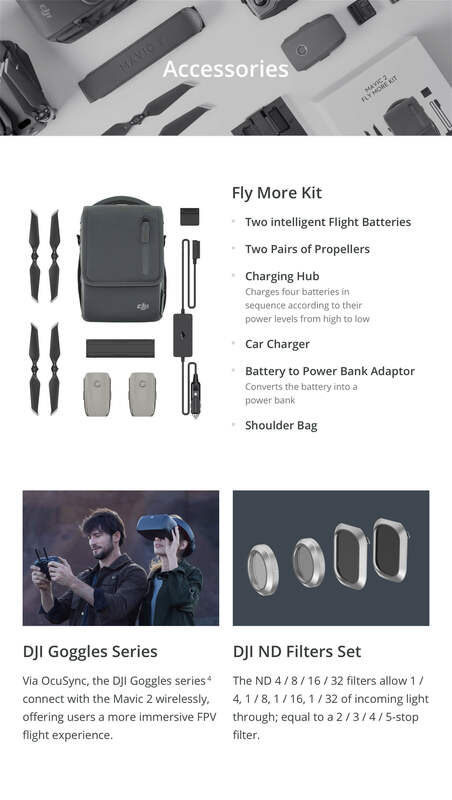 And for low-light situations, including indoor flight when GPS is not in use, bright built-in lights assist downward sensors. The lights are visible during flight, even in daytime. 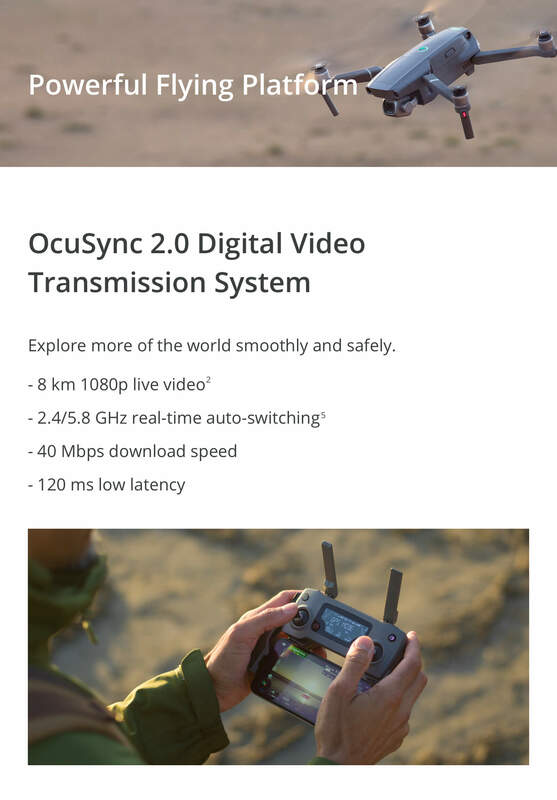 The Mavic 2 Pro’s live video transmission is beamed at 1080p from as far as 5 miles, which is full range, using OcuSync 2.0. 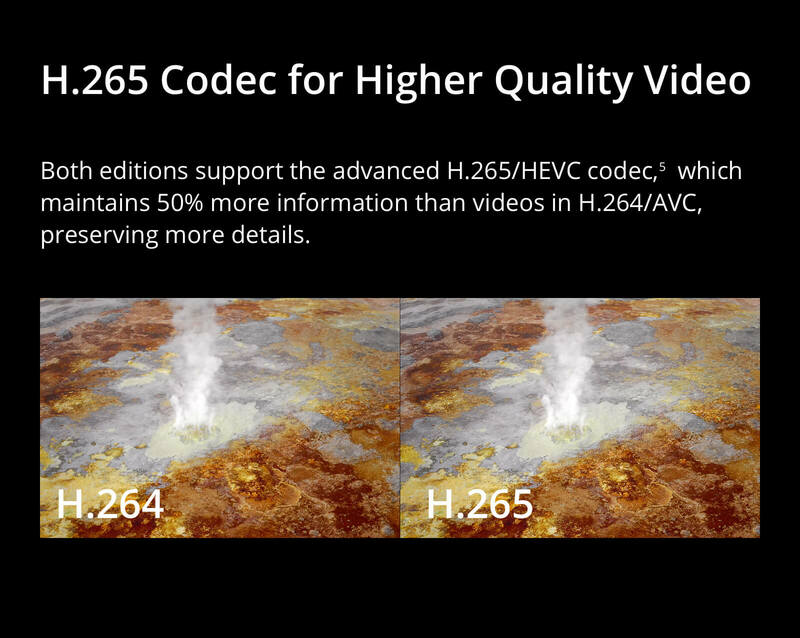 It delivers strong signals, avoiding interference with automatic switching between 2.4 and 5.8 GHz frequencies.